After more disappointment at Scheldeprijs, series of 'crisis' meetings planned to address the fast-fading sprinter's form. GHENT, Belgium (VN) — Team Katusha-Alpecin says that it cannot go forward with German sprinter Marcel Kittel in poor form. The team is planning an “urgent” meeting with the sprinter before his next planned race at the Tour of Yorkshire, May 2. “But before he thinks of races, we have to try to get him back on track,” sport director Dirk Demol told Het Nieuwsblad after yesterday’s Scheldeprijs. Kittel won five times in Schoten at Scheldeprijs, but placed 99th in the 2019 edition, Wednesday. He was dropped in the early hours of the race on the flats and closed the day far from the podium celebrations in 2012, 2013, 2014, 2016, and 2017. He counts 14 Tour de France stage wins in his palmarès. However, since joining Katusha-Alpecin for 2018, he has won only three times – twice in the 2018 Tirreno-Adriatico and in the Trofeo Palma this February. 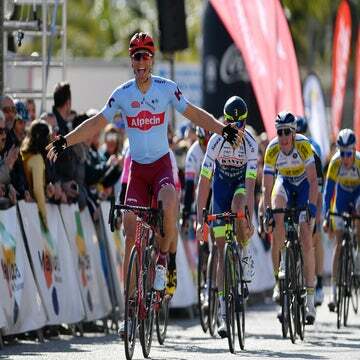 Not only did Kittel fade early in Scheldeprijs, he did the same in stages of Paris-Nice and in De Panne. Kittel left Quick-Step for Katusha in 2018 when the Belgian team needed to free up budget with so many star riders, including Fernando Gaviria. Het Nieuwsblad reported that even the Belgian team were concerned about his fragility. In the 2018 Tour de France, tensions showed. Kittel placed third and fifth in the early stages, but then missed the time cut, alongside other sprinters including Mark Cavendish, in stage 11. Kittel is only 30 years old and, in theory, has many years ahead of him to win more races. However, Katusha may not be interested in renewing his contract unless the situation changes. His “head is not right” at the moment for cycling, said former Belgian cyclist Jürgen Van Den Broeck in a live chat on Sporza yesterday. Kittel’s tentative schedule includes the Tour of Yorkshire and the Tour of California before the Tour de France this July.